Phonemic Awareness needs to be directly taught in Kindergarten and 1st Grade. At my school, we try to teach the skills both universally to the whole class and then in small groups during Guided Reading groups. This small group instruction is very important because it gives teachers a chance to assess students and deliver instruction that is just right for the student's reading level. 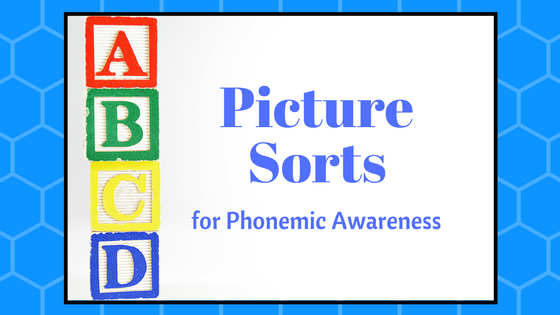 One strategy that works well to develop Phonemic Awareness in small groups is Picture Sorts. This engaging activity is hands on and the students love it! Picture sorts can be used with sounds in all positions of words such as the beginning, middle, or end. Give students pictures that represent two very different sounds as they begin sorting. As students become more proficient, then the sounds can be more similar. Tell students the sounds they are sorting. I use a sorting mat but you can also use a white board or just put some headings on the table. In the Levels Pre-A through B, with early phonemic awareness, you need to use pictures as well as letters. Later, the letters will be enough to indicate the sounds that students are sorting. Tell the students the picture. It wastes time to have them guess and that is not your objective. Phonemic awareness, which is hearing the sounds, is always the goal. Have the students say the picture. The students then stretch the sounds in the word. When the student is segmenting the word, they can use dots, fingers, their arm (shoulder, elbow, wrist). The student stretches the word to hear every sound (ie. B-A-G). The student decides what sound they hear in the position on which you are working (initial, medial, or final). They put the picture in the correct place. The teacher needs to scaffold as necessary. I like to add word cards once children are starting to read and blend letters together. I start adding word cards with my Short Vowels Picture Sorts around Level C, and I think this helps students transfer knowledge to their reading. One strategy I love to use with Kindergarten students is adding pictures of their classmates when working on initial consonants. The students love it and it gets them thinking about print and sounds that are all around them at school. A bonus is how special a child feels when their picture is included in a picture sort. If some students have a blend or digraph at the beginning of their name, perhaps you can use their picture with ending consonants or vowel sounds. The students really enjoy being included. Picture Sorts are a great strategy to add to your Guided Reading groups for beginning readers. Phonemic Awareness is a crucial component for beginning readers and writers to develop. Without this underlying instruction on how sounds build together to make words, students become sight word readers and struggle to apply phonics to both reading and writing. I always equate Phonemic Awareness in reading to Number Sense in math. I might know the number 5 by sight, but until I have number sense I have trouble using 5 with any power. I wanted to make sure that the early primary teachers at my school have the tools they need so I developed seven sets of Picture Sorts. I have beginning sounds, long vowels, final consonants, short vowels, digraphs (initial and final), initial blends, and final blends. You can find the individual Picture Sorts here. If you have a wide variety of needs in your classroom, I bundled the sorts together and you can purchase the Picture Sorts Bundle for Guided Reading here! I hope Picture Sorts are a hit in your classroom!